This is Forest Pitch, Scotland’s sole public art commission for the London 2012 Cultural Olympiad. It is the work-in-progress of Craig Coulthard, 30, musician, midfielder, prize-winning painter, and now conceptual artist. 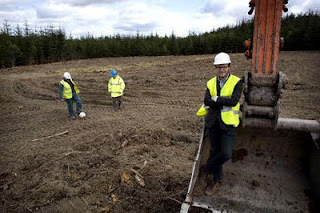 Mr Coulthard’s notion is to clear a space in a commercial forest, level it, plant the pitch, and finally play two games of football, one each for men and women, in fixtures timed to take place just ahead of the opening of next year’s Olympic Games. The aim is to address “fundamental issues in contemporary Scotland”, including national identity and ecology. To these ends, the teams playing in the forest will be formed from a diverse group of players, chosen from immigrants, domiciled in Scotland who have taken up British citizenship since 2000. Mr Coulthard said the work would demonstrate the country had been “immeasurably enriched” by immigration over the centuries and would show sport as “powerful agent of social cohesion”. As soon as the games have been played, native species such as ash and oak will be planted out along the markings of the pitch, and also positioned to signify players’ formations commonly associated with the game. The turf will no longer be cut. 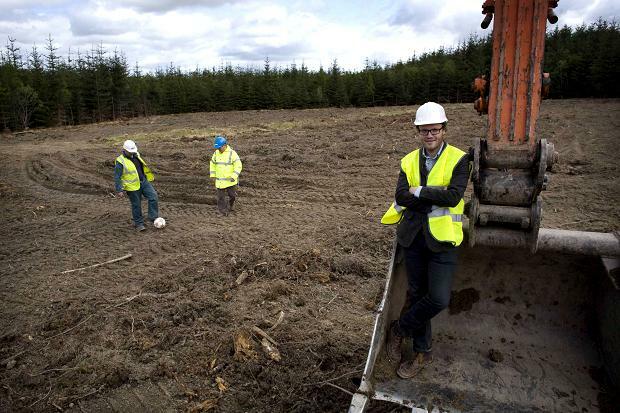 Slowly Forest Pitch will revert to nature, replacing the ugly, non-native Christmas trees that sterilised the environment, with indigenous and biodiverse broad-leafed woodland. These noble aims are seasoned by the artist’s obvious love of the game. As a child, Mr Coulthard regularly played football in a forest near Dusseldorf, close to the RAF base where his father was stationed. There’s something mysterious about playing football in a forest,” said Mr Coulthard. “It’s eerily quiet, and there’s a watching audience of trees." Later, as a teenager, he played for St Andrews Colts against Rangers Boys, at Cathkin Park, the dilapidated former home of Third Lanark, the Scottish league side bankrupted in the 1960s. More recently still, after his bad eyesight began letting him down, he converted from goalie to midfield. By that time, as a student he was playing for Edinburgh College of Art FC. As well his ball skills, he proved an accomplished painter, winning the Sir Robin Philipson Memorial Medal. This foray into conceptual art was inspired by the sight of Borders forests from the air, when he took flights to Edinburgh from London, and the notion came to him of cutting out a bright green space in the dark canopy of the plantations. He put forward the idea to the Artist Taking the Lead competition, for the London 2012 Festival, and won, beating a host of better known artist to win his £460,000 commission, funded by the Arts Council of England and Creative Scotland. Mr Coulthard’s immediate aim now is to recruit professional football coaches to train up his four teams of new British citizens, for the game. So what will he say to the players when they turn to him and say: “We don’t mind playing football, but why on Earth play the game in the forest?" Hilarious irony in the comment re ugly 'non native' trees. Be sure and check the seed certificates of the native ones! Does God want more than Devo Max?